Several members of the Taunton Area CCIT have participated in local, regional, and national trainings and have developed a comprehensive classroom training program. The Taunton CCIT has achieved community wide acceptance and a reputation for quality training in meeting the needs of the mentally ill and developmentally disabled persons that are involved with or at risk of involvement with the criminal justice system. CCIT's success is achieved through two program components which consist of: 1) Training and 2) Case Conferences. Core members of the Taunton CCIT, with the assistance of others, provide three successive days of training on adult issues and two successive days related to youth issues for police officers, emergency department nurses, hospital security staff, mental health and developmental disability providers, court personnel, first responders and other community professionals. 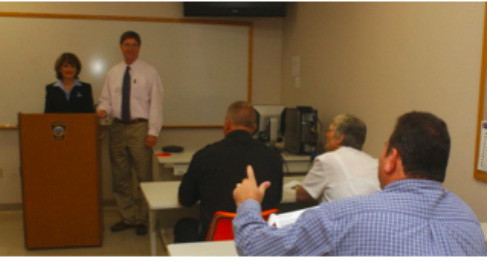 Participants of CCIT training will be equipped with the skills required to assist in identifying and defusing escalating situations, and will have the knowledge base and comfort level necessary to navigate the bureaucracy of institutions that often times seem counter-productive to the successful resolution of crisis situations. Due to limited seating, please call Kathy Lalor @ 508.977.8138 to confirm space availability prior to submitting registration form. Once confirmed, please click print to access hardcopy form, complete and email to kathylalor@yahoo.com or fax to 508.821.2519. You can also contact Kathy Lalor via email to be sent a copy of this form. * Police Officer Safety, "Do's and Don'ts"